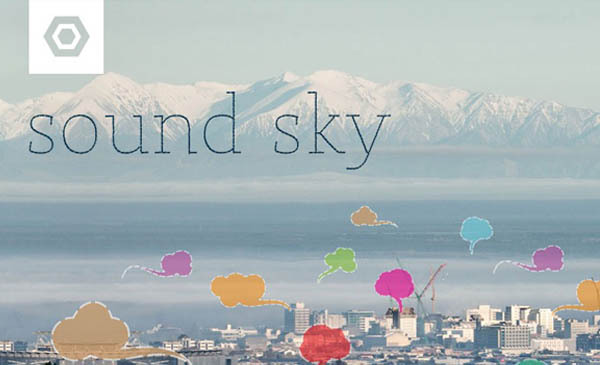 Sound Sky is a location-sensitive audio-visual artwork for Christchurch which will be constructed from and inspired by spoken and recorded contributions from residents. Using smartphones (currently iOS only), the work will allow people to listen to and share memories of the past, create playfulness in the present, and plant visions for the future. In this way the audioscape will grow as the city grows and emerges over many years following the tragic events of 2010-2011. Take a wander and listen to the audioscape via the app while in central Christchurch. Pick a place in the city that has a memory or story for you and try recording something. Questions in the iOS app allow you to share personal stories or memories, make recordings of what is going on around you, or add visions and moments from possible futures. Audio recordings created are geo-located and can only be heard where they were recorded. As the audioscape grows over time, listener/participants will be able to experience a continuous weaving together of location-specific voice content and musical composition, all related to the city, and its people in this transitional time.